A schoolfriend of mine who now lives in Australia has recently been posting some extremely impressive photos of silver jewelery he has been making from scratch. He has designed his own workbench with various size mandrels for winding his own silver wire to make links for his chains. He has been experimenting with many different patterns of joining the links to make some beautiful and intricate jewelery. He has inspired me to have a go myself. Rather than winding and cutting my own links, I thought I’d buy a bunch of links to see if I enjoyed chain making. After spending a few hours online looking for good reviews of link makers, I settled on the DragonFly Company who had lots of positive testimonials and are based in the UK. I ordered a small batch of jump rings – 200 x 2.75mm x 0.8mm in sterling silver (about £12 including postage). While I waited for them to arrive, I bought a clasp and two pairs of jewelers’ pliers from Helios Fountain which also has a huge range of beads, baubles and bling which I might use in future projects. 2 days later, my package from the Dragonfly Company arrived – A DVD box-sized cardboard box containing a tiny ziploc bag of 200 super-shiny silver jump rings which it turns out are hand made to order and then tumble polished before they are sent out. I also received a very cute dragonfly charm as a free gift – nice touch! and all safely wrapped in tissue paper. I’d been looking online for sites which would explain the different chain patterns and picked up all sorts of tips on the best way to open and close the links. 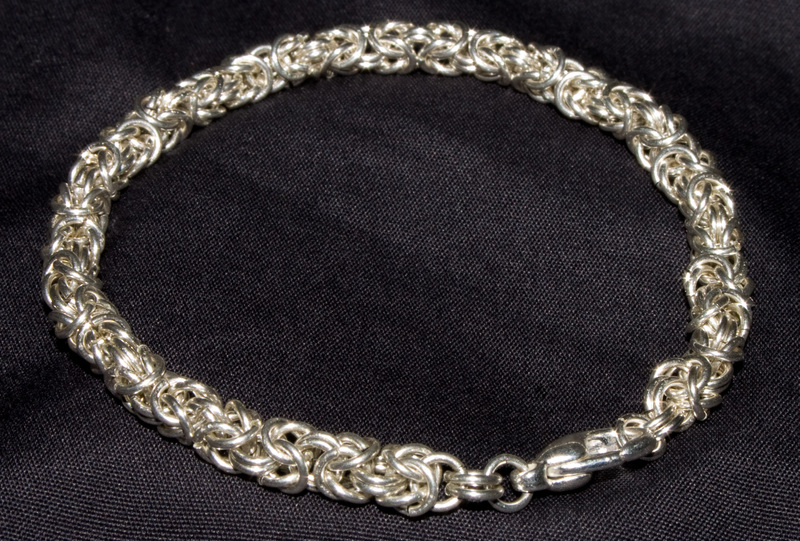 There are hundereds of sites dedicated to chainmaille which show many different patterns of chain. I decided to bite the bullet and go for a reasonably complicated one to start with, a Byzantine chain. Following the diagrams at Maille Artisans, I struggled to hold the tiny ring with the pliers and dropped the whole thing on numerous occasions but, after spending a bit of time with it and building up some muscle memory, the whole thing got a bit easier and actually became quite relaxing. As the weather was so nice, I popped the tiny chain, the links and the pliers in the cardboard box and headed out to Greyfriars’ to sit in the sun and finish the chain. After a few hours work, it was complete – I’d used all 200 links without wasting any and the chain fit perfectly round my girlfriend’s wrist. I’m delighted that my first chain was a success, and after tidying up a few dodgy joins it looks pretty professional. I’m now looking for something else to make – possibly a necklace with a couple of different patterns or a chainmaille ring. I’m also trying to decide whether it is worth the effort of making the jump rings myself, or just continue buying them from a professional who knows what they are doing and makes links with a precision saw and very tight tolerances. I think it would be very satisfying to know that I had made every part of the chain… anyone know how to make silver wire from a lump of silver? Do you have any suggestions for a nice challenging second chainmaille project? Leave me a comment with your suggestions! Daws: Good work mate! I liken the chain making process to knitting, and as you've found out, it's quite a relaxing thing to do once you get into it. It's satisfying to make the rings but it's a bit more of an effort and can be a little tedious. If you want to make wire from bullion, that's a bit more effort! First of all you need to melt it in a crucible with an oxy-acetylene torch and pour into a round ingot mould, then roll the ingot in a rolling mill, then draw the wire in a drawplate until it's the required diameter, annealing it constantly. Looking forward to seeing your next piece.